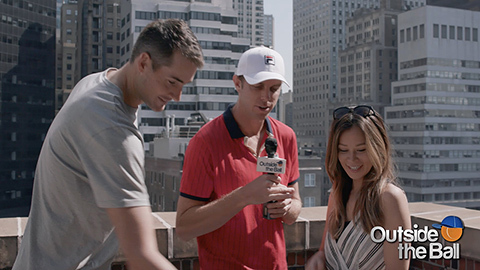 On the rooftop of the St Giles Tuscany Hotel, Outside the Ball host Mayleen Ramey joined John Isner and Sam Querrey for breakfast. The Americans were served a vibrant tray of the familiar and the exotic. We wanted to find out how the well traveled tennis pros could identify fruit from around the world. “That’s obviously a Jackfruit and dragon fruit.” John Isner proudly pointed out as they inspected the display of fruit. “There is blueberries and strawberries. That’s a raspberry. I see some pineapple.” Sam Querrey jumped in with confidence. Mayleen picked up a small round fruit and asked the men if they could name it. Both of them stumbled. “We’re not sure, are we?” Sam asked John with a grin. “You don’t get credit for saying blueberries or strawberries!” John joked back. When asked if the players tried the mysterious fruit John said it was very tasty, but Sam wasn’t so sure John was telling the truth. “I did. I didn’t actually see John. 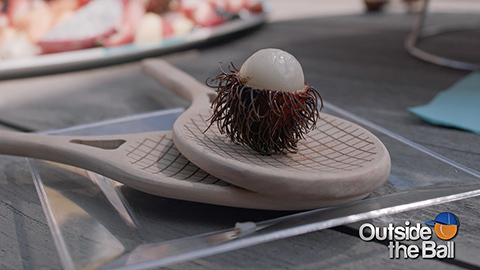 John you should try it!” After John insisted that he had, Mayleen announced the exotic fruit in question was the Asian fruit rambutan. You never know what you’ll find during breakfast at the Tuscany. Thank you to the St Giles Tuscany Hotel and Citi Taste of Tennis for having us!